Shred the potatoes in a food processor. Return the shreds to the food processor, this time with the S-blade (the sharpest blade, not the dough hook). Add the onion chunks. Process until the potatoes and onions are in tiny pieces. Place the mixture in a strainer (or kitchen towel) and squeeze out as much of the liquid as possible. Discard the liquid. Place the potatoes in a bowl and, if desired, scoop about 3 tablespoons of the potato starch that remains from the discarded liquid and add it to the potato mixture (or use the flour or matzo meal). Stir in the eggs, salt, baking powder, and black pepper. Heat about ¼-inch vegetable oil in a large skillet over medium heat. When the oil is hot enough for a breadcrumb to sizzle, add 2 to 4 tablespoons of the potato batter to the pan, depending on the size pancakes desired. Fry for 2 to 3 minutes per side, or until well browned. Drain the latkes on paper towels. Serve with sour cream or applesauce, if desired. To reheat the cooked latkes, preheat the oven to 450 degrees. Place the latkes in a single layer on a cookie sheet. Bake for about 5 to 7 minutes. If frozen, bake for about 15 minutes. 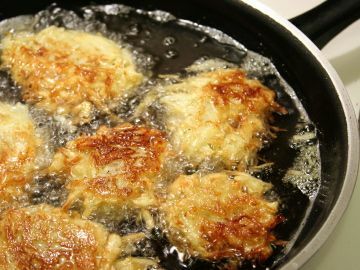 Turn the latkes 2 or 3 times during baking.